This month's Disability Resource Library newsletter focuses on young adult fiction. In an age of social media, it may be hard to convince your young adult to put down their phone and pick up a book. Well, we're here to help! 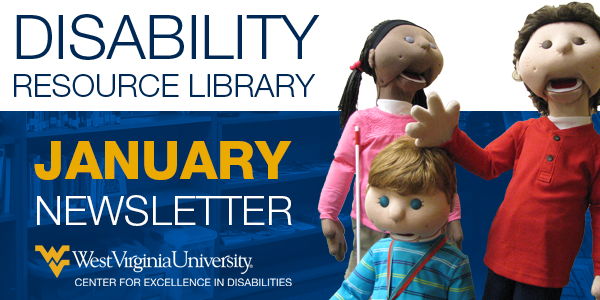 Take a look at just a few of our offerings from the Disability Resource Library. Remember, you can visit online anytime to search our entire inventory. Happy reading and Happy New Year! Auggie was born with a facial difference that prevented him from going to a mainstream school - until now. He's about to enter fifth grade at Beecher Prep and if you have ever been the new kid, then you know how hard that can be. The thing is Auggie's just an ordinary kid, with an extraordinary face. But can he convince his new classmates that he's just like them, despite appearances? Do yourself a favor and read this book! Mesmerizing! Just press and hold your capability switch and be rewarded with 64 LEDs in an animated 3D light show with music. The cube’s ever changing patterns are mesmerizing and exciting. Fantastic for increasing visual attention, visual tracking and listening skills. Also works without a switch. Size: 5"L x 5"W x 6½"H. Requires AC Transformer (included). Developing self-advocacy skills are critical to your son or daughter being successful in adulthood and employment. Information on how to effectively build these skills can be found in our Disability Resource Library or in the Autism Speaks Employment Tool Kit. Meet our January Child's Champion, Pam Holland, MA/CCC-SLP, BCS-S. Pam is a Language Pathologist, Feeding Therapist, and is a Board Certified Specialist in Swallowing and Swallowing Disorders. Since graduating from Marshall University, she has worked in a variety of health care and educational settings. Pam started working at Marshall in 2002 as a part of the RiteCare Clinic sponsored by the Huntington Scottish Rite Freemasonry. They provide support for children and families who otherwise could not afford ongoing services. She has served with the WV Birth to Three program for many years and founded the Marshall University Feeding and Swallowing Clinic in 2013 with CED's very own Angel Casto. Pam is inspired by children and their families as well as the professionals she works alongside. As a faculty member in the Department of Communication Disorders at Marshall University, Pam is motivated daily by her students. "They teach me so much!" she shared. Pam writes inspirational quotes on her office door. What's there currently? “Your positive action combined with positive thinking results in success." - Shiv Khera.